On view in the gallery’s office space is Destroy’ed and Rebuilt, a special presentation of works by UR New York: Fernando Romero and Mike Baca, a graffiti duo from New York City. Known for their urban-industrial aesthetic, the pair has been collaborating since 2006, combining graffiti, photography, screen-printing and graphic design in their impactful mixed-media works. With a philanthropic mission to connect to youth culture and to share the powerful potential of self-expression, the duo embraces experimentation and the diversity of context and environment. 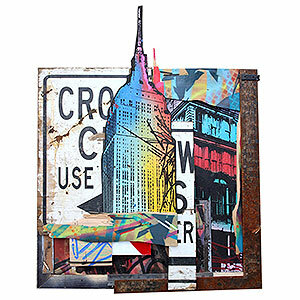 Born and bred in New York City, URNYC began making art on the streets and in the city’s subway system. Now, their work has been showcased internationally, in museums, galleries, and cultural platforms across the world.